Over the years, the Jeep Grand Cherokee has consistently ranked among the best midsize SUVs on the market. Drivers enjoy its versatile design and rugged styling. While the 2019 Grand Cherokee manages to offer impressive everyday comfort, it’s still tough enough to handle a challenging off-road excursion. Is the new Grand Cherokee a good option for you? The 2019 Jeep Grand Cherokee has become an even better value than before. It now comes loaded with more standard features, including safety innovations like blind-spot monitoring. Jeep also introduces a new Limited X package, which gives the SUV a special look. No changes were made to the SUV's engine lineup. The overwhelming majority of Grand Cherokee buyers will choose the base Pentastar V6 engine. This engine has been used in a number of other vehicles, including the Dodge Charger and the Ram 1500 pickup. With a total output of nearly 300 horsepower, it’s certainly strong enough for most tasks. An eight-speed automatic transmission helps the Grand Cherokee to feel quite responsive. Two-wheel drive models can return up to 26 mpg. If you desire fuel savings, check out the Grand Cherokee’s available EcoDiesel engine. It helps the SUV to deliver more than 20 mpg in town and and an EPA-estimated 30 mpg on the freeway. This means the EcoDiesel-powered Grand Cherokee is just as economical as some family sedans. Not only is the EcoDiesel engine very efficient, but it also promotes strong acceleration. The 2019 Jeep Grand Cherokee Trackhawk is built for the drivers who want to go fast. Motivating this exhilarating model is a 6.2-liter, supercharged V8 engine. Jeep tweaked it to unleash more than 700 horsepower. A 0-60 time of 3.5 seconds makes it one of the quickest SUVs on the street. Jeep also has a less potent SRT model, which packs 475 horsepower. Both of these high-performance models come equipped with an adaptive sports-tuned suspension and a sleek body kit. You can definitely use the 2019 Jeep Grand Cherokee to tow stuff. In fact, it’s an excellent substitute for a pickup truck. While the base V6 engine is a good option for pulling light loads, the EcoDiesel and V8 engines are especially great for towing. You will be able to confidently tow more than 7,000 pounds. This is a major benefit for the drivers who need to transport a camper or track car. Unlike some of today’s crossovers, the 2019 Jeep Grand Cherokee is tough enough to tackle rugged terrain. Serious adventure seekers should check out the award-winning Grand Cherokee Trailhawk. It comes outfitted with several off-road goodies. While a Quadra-Lift air suspension helps you to climb over rocks and stumps, low-range gearing helps you to overcome sticky situations. Some of the other upgrades found on the Trailhawl model include underbody protection, all-terrain tires, and tow hooks. Your family will enjoy riding in the new Grand Cherokee. Wide-opening doors and a spacious design enable everyone to easily climb aboard. Reclining rear seats come standard. Because of the Grand Cherokee’s extra legroom in the front, it remains a solid choice for tall drivers. A whisper-quiet cabin enhances the SUV’s relaxing atmosphere. You will certainly like taking the Grand Cherokee on road trips. There’s roughly 36 cubic feet of available cargo space, which is a key asset for the drivers who enjoy an active lifestyle. This year, the 2019 Jeep Grand Cherokee comes standard with an upgraded infotainment system. Every driver can now enjoy Apple CarPlay and Android Auto mobile integration. Jeep's Uconnect interface has received high marks for its overall simplicity. You'll be able to easily stream music and access smartphone apps. Drivers like Uconnect’s clear and concise menu. A larger 8.4-inch touch screen is available as an option. Jeep gives you several different Grand Cherokee trims to choose from. The new Limited X appearance package is expected to be a popular upgrade. It will cause onlookers to take notice. A muscular SRT hood and sleek front fascia give the Grand Cherokee Limited X an extra touch of sportiness. On the rear, black chrome exhaust tips bolster the SUV’s curb appeal. You’ll also notice the 20-inch Granite Crystal wheels. Jeep has updated the Grand Cherokee with some important safety technologies. While blind-spot detection helps with lane changes, rear cross-traffic alert makes backing up less of a pain. ParkSense Rear Park Assist now comes standard as well. You also have access to advanced driving aids like forward collision warning and lane-keep assist. As you know, parking in busy areas can be a big-time hassle. Fortunately, the 2019 Jeep Grand Cherokee can be equipped with an automated parking system. Activating the system enables the SUV to essentially park itself. Although you will need to press the accelerator and brake, the system will control the steering. In terms of impact protection, the 2019 Jeep Grand Cherokee has some weak points. Last year, it only received a four-star overall safety rating from the federal government. Rivals, such as the Honda Pilot, earned a perfect overall rating. The IIHS gave the Grand Cherokee a “Poor” rating for its side impact protection. Meanwhile, a “Marginal” rating for driver-side safety is also a black eye for the Grand Cherokee. These low marks may concern the drivers who’ll be traveling with their family. Opting for one of the Grand Cherokee’s V8 engines will force you to spend extra at the pump. Four-wheel-drive models equipped with a V8 will only deliver 14 mpg in town. Of course, the high-powered SRT and Trackhawk models are especially thirsty. The required use of high-octane gas is an additional expense. 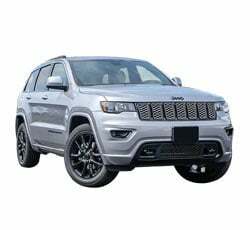 The 2019 Jeep Grand Cherokee is a heavy automobile. Some models weight more than 5,000 pounds. This extra mass definitely hurts the SUV’s handling around curves. Although the high-performance variants benefit from a sports-calibrated suspension, they still aren’t as athletic as a smaller vehicle. Some drivers will be disappointed with the Grand Cherokee’s optional adaptive cruise control system. It doesn’t work very well during real-world driving conditions. It tends to overreact to other vehicles in the road. When using adaptive cruise control on a jam-packed interstate, expect to become a bit annoyed. Drivers who want to buy a supercharged Grand Cherokee Trackhawk should prepare to spend a lot of cash. When equipped with the available options, prices for the Grand Cherokee Trackhawk can soar past $100,000. Even the less powerful SRT model can demand upwards of $70,000. Most people will find these models to be beyond their price range. Aside from the higher price tag, you must also factor in the cost of maintenance. The 2019 Jeep Grand Cherokee goes head-to-head against the 2019 Ford Explorer and the 2019 Honda Pilot. While these competitors can match the Grand Cherokee’s comfort, they can’t contest its legendary off-road capabilities. Equipped with a twin-turbo V6 engine and an adaptive steering system, the Explorer Sport rivals the performance of the Grand Cherokee SRT. Unfortunately, Honda does not make a high-performance variant of the Pilot. You can also compare the 2019 Grand Cherokee to the 2019 Toyota 4Runner. While the rugged 4Runner is just as tough as the Grand Cherokee, it does not feel as comfortable on the inside. Furthermore, the 4Runner isn't fun to drive on the street. There are a lot of reasons to like the 2019 Jeep Grand Cherokee. It’s a multipurpose SUV that the entire family can enjoy. Not only can the Grand Cherokee deliver the driving excitement of a muscle car, but it can also pull heavy loads like a pickup truck. If fuel economy is a concern, stick with the base V6 or opt for the EcoDiesel engine.